Axiom is proud to introduce the new WordPress theme Alhambra to its users. 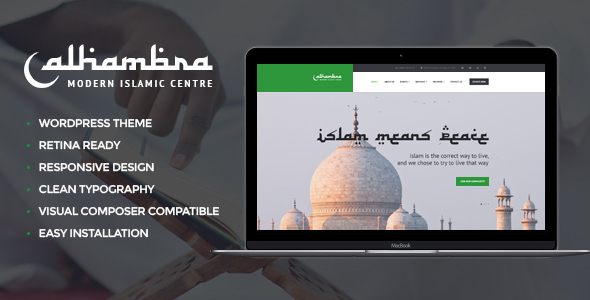 Itâ€™s a light and clean design dedicated to an Islamic centre or Mosque, or any non-profit Islamic organization. The theme offers a number of elements your website will definitely need. One of them is Right-to-Left version, if you need to switch your website to e.g. Arabic. Another one is Sermons â€“ they can be easily uploaded to your website, divided into categories and displayed to your users in audio and video formats online; sermons also will be available for download in PDF format. The theme is supplied with ThemeREX Donations Plugins that allows to set up causes and to help those in need. Alhambra features easy-to-use Event Calendar to showcase whatâ€™s coming up in your centre, various layouts of the news and photo galleries.